Marie De Bièvre worked in pastels as well as oils, producing contemporary versions of still life paintings derived from the Dutch and Flemish masters of the 17th century. She had an acute eye for colour contrasts and harmonies, and her most successful works often contrast the warm shades of fruit with cool tones of flowers, as here. 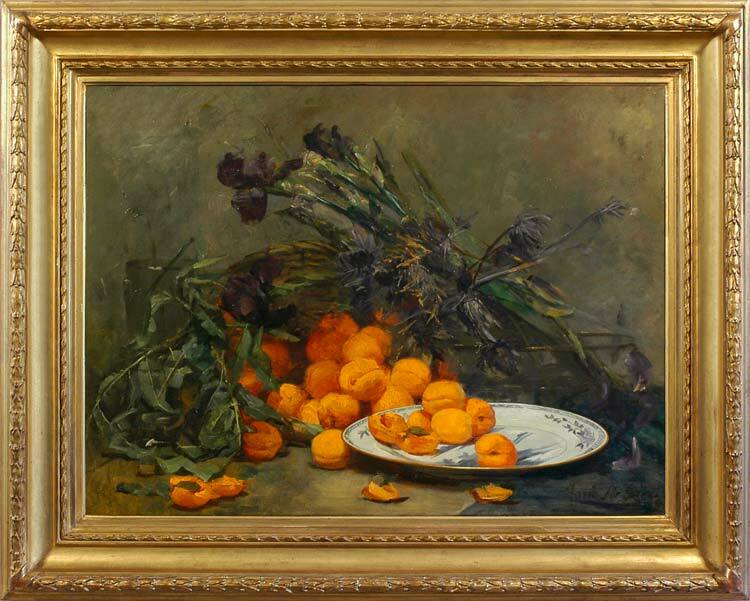 Radically, the bunch of iris and sea holly (or Scotch thistles) slung casually into a glass bowl of water have been darkened almost to black, so that the piercing golds and oranges of the fruit flare out with intensified power, and the beautifully realized porcelain plate, with its glazed highlights, becomes a spotlit pool in the foreground. De Bièvre’s work could hold its own against the great masters of the later 19th century, Fantin Latour and Manet. Marie de Bièvre was born in Sint-Joost-ten-Node in 1865, and attended the local art school; she later moved to Brussels, where she lived in rue de Livourne (an address which is occasionally found inscribed on the stretchers of her paintings). In 1883 she helped to found the Cercle des Aquarellistes Aquafortistes et des Belges, of which Willy Finch was a also member. This group was strangled by its traditionalism, and foundered quite quickly; De Bièvre went on to found a group of artists named Voorwaerts (1885), and Cercle des femmes peintres (1888), which petered out some time after its fourth exhibition in 1893. She exhibited in the 1893 World Expo in Chicago; the 1894 Expo Universelle in Antwerp; and the Paris World Fair of 1900; also in Berlin. A pastel, Rhodoendrons and azaleas, was shown in the Munich Exhibition in 1905; her work was shown in the Ghent Salon of 1902; three paintings were in the Brussels Salon of 1907; and the Museé Royal des Beaux-Arts de Bruxelles owns her painting, Azaleas and violets.